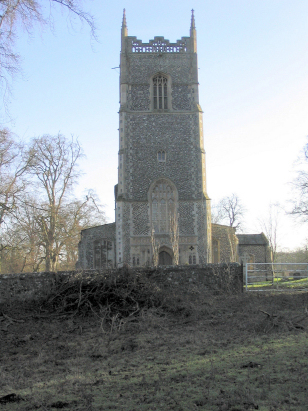 The parish of Hilborough is located in south central Norfolk about 6 miles south of the market town of Swaffham. Hilborough is a small and relatively compact village sitting on the A1065 road which connects Swaffham through to Mundford and the Suffolk town of Brandon. Hilborough is dominated by its Hall which, within its estate, sits on the western banks of the river Wissey. The economy of the village would have been dominated, as it is today, by agriculture, the parish, however, sits on the edge of Norfolk's Breckland and the poorer soils would have meant a more mixed farming regime than is commonly found further east in the county. The presence of fathers who were shepherds and warreners indicates something of this diversity as the poor soils were exploited as best one can. All Saints' church sits to the south of the village away from the A1065 and close to Hilborough's mill on the Wissey. 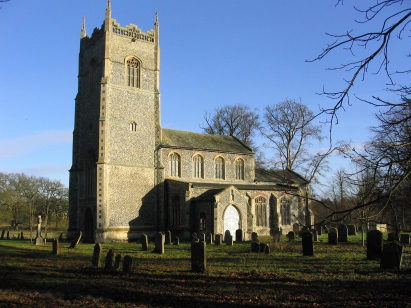 The church is fairly typical of many Norfolk churches being predominantly in the Perpendicular style albeit the chancel is in the Decorated style of the early 14th century. The build clearly traversed this fashion change as the later parts are firmly perpendicular. A wealth of documentary evidence shows donations for additions and improvements as late as 1516. As with most Norfolk churches there was a Victorian restoration, in this case of 1859 but for once it escapes vilification from Pevsner so it was either sensitive or light. The church is approached along an unmarked gravel lane which leads east from the A1065 just before the road reaches open fields. The churchyard is fairly open with few obstacles preventing photography. A single standard 800-entry register book covers the period of this transcript and runs onward to complete in the early 20th century. This register is filmed on Microfilm MF692 in the collection of Norfolk Record Office. Images of this register are available freely to view on Familysearch and also to subscribers of the two main subscription sites. The register is fairly typically kept with good and poor entries but in the main it was adequate to the task making for a straightforward piece to prepare.